BsnTech Networks worked with a customer a few months ago that turned sour. Here at BsnTech, we strive to be a low-cost website and graphic service provider to help those that don’t have a large budget. Unfortunately some of those customers turn out to be problematic and fraudulent. We typically do not write about such customers, but this customer was quite the exception and felt it was compelling to write about this individual and their business in hopes that others may find out about them. Mina Sidi, the owner of Best Life Coachings (also may be known as Best Life Coaching, Life Coaching By Mina, or Affordable Certified Life Coach) had contracted us to create a website for her back in April. We spent at least eight total hours between phone conversations and the actual work on her website. As noted on our phone number, all phone calls are recorded specifically for the purpose of these customers that are fraudulent. While we won’t post the actual recorded phone calls here, they do remain archived for future use if needed. In the phone conversations, Mina noted several times that she was extremely happy with the responsiveness that we provided along with the website that we created for her and her business. We even went above and beyond and did other work for her that was not billed – just to ensure that we were ensuring she was completely satisfied since she also promised more work down the road to create another membership-based website for her. After we had the website fully completed and done, she then contacted us again with a list of changes that her colleagues requested to have done on the site. Again, we worked quickly to have all of these changes done within 24 hours just as her colleagues mentioned. Unfortunately, she began having problems with her hosting provider – HostGator. While we are not sure what kind of problems she had with them, she called us up and asked us to fully create a new website for her using a different hosting provider. This request was unfair and unjustified. She did tell us that she was willing to pay more for us to create the site, but she wasn’t going to pay for the additional work that we accomplished – which her colleagues requested. BsnTech Networks does not use proprietary website building systems anyways. We make it a policy to do this because when you use a proprietary website builder program, you are not able to move the website to any other provider; you are stuck with the provider that the web builder was designed by. This has repercussions down the road – from the provider going out of business or significantly increasing the monthly/recurring costs because they know they can (unless you want to lose your website and start over again). Therefore, this post is simply to provide feedback on this customer and to warn any potential customers to Best Live Coachings / Life Coaching by Mina / Affordable Certified Life Coach. This business should be avoided at all costs and we find it interesting that the business “specializes” in provide life coaching – but yet they fraudulently disputed the costs associated with building their website. Lee Burnham contacted us a few weeks back in regards to helping him with some website tasks. In the end, he was able to get most of the work done himself, but he still needed some other help. A website he created had a wrong telephone number on it. To “break the ice” with Lee, we offered to go in and update this phone number on the website at no cost. This got us started off with a great relationship with Lee. From there, he decided to have us take over two domain names and create a website or him – and also provide website hosting for that site. The site which we created is a simple blog website called Parenting Tool. It will allow Lee to provide articles and information to parents seeking help and guidance with parenting. In addition, Lee had another website that he needed a few changes made to. Those were all completed for him as well. We appreciate the business from Lee and look forward to other work he will provide in the future! 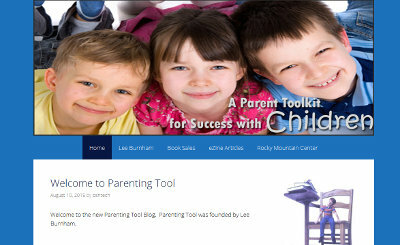 The Parenting Tool website is at parentingtool.org. Ali, the owner of VA ATM Network, contacted us in order to have a website made for his business. One of his employees, Tammy, then worked with us to handle all of the communications for setting up the website. Over the course of a few weeks, we obtained everything that we needed to complete the site. We worked just as quickly as the information for the website design was provided to us. Just last week, Ali and Tammy have approved of the website and it is now live! We appreciate the business to create a website for them. 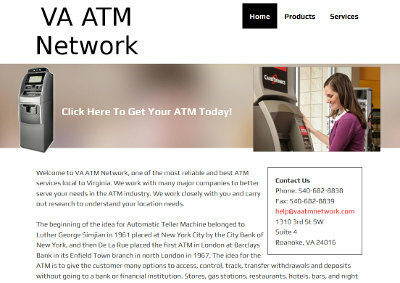 The VA ATM Network website is at vaatmnetwork.com. Fatai had contacted us earlier this year to create a website for him. He was very impressed with the work we did on the website and our responsiveness. Therefore, he awarded us some additional business to re-create his own personal website. Originally, he wanted us to just copy his current website over and have us host the site and manage his domain name. However, he opted to go ahead and have the site re-designed as well. Within two days of the payment being received, his website was fully setup and completed. We appreciate the continued business from Fatai! 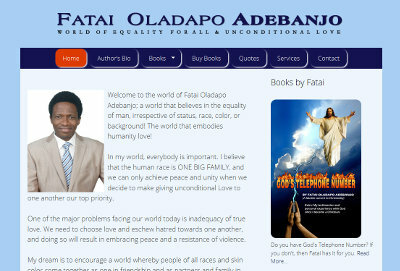 His personal website is at fataiadebanjo.com. Cheri, a current customer of BsnTech Networks, contacted us several months ago to have us setup a new website for her other business – Country Creations / DV Sweets. Cheri has an artistic hand and creative touch when it comes to creating confections including chocolates, cakes, candies, and more. Therefore, she wanted to have a website created that would showcase some of her work and also advertise her available services. Cheri sent us over the background image that she wanted for her website along with all of the pictures. Over the course of several months, we worked on the website a little bit at a time. Cheri has a very busy schedule with delivering puppies to new homes and also breeding – so she wasn’t able to sit down and fully provide us everything in one shot. However, anytime that she sent us requests or changes, we took are of them very quickly. We appreciate the continued business from Cheri, and it definitely shows that our service to our customers is top priority with the return of many customers for additional services. 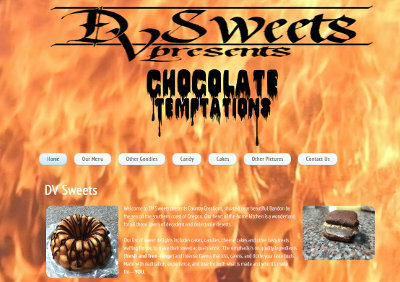 The DV Sweets website is at dvsweets.com.